Motrac Hydraulics have developed the hydraulic systems for spraying machines for a number of manufacturers, including Agrifac and Amazone. 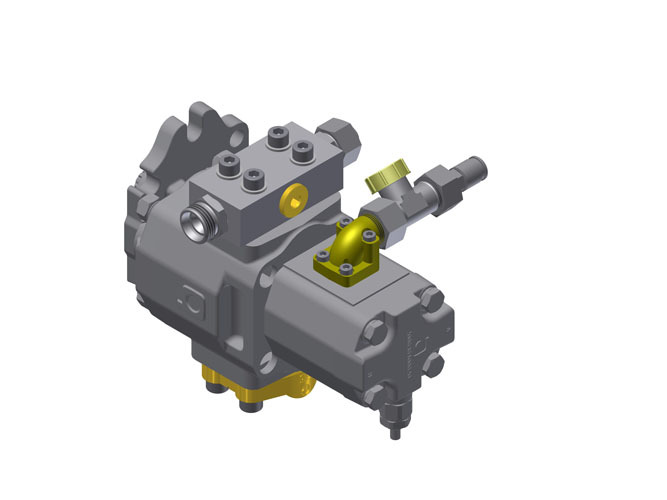 There's a lot more to this than a simple hydraulic pump. The system elements are precisely coordinated, with components carefully selected to deliver the highest possible efficiency. Motrac Hydraulics offer hydraulic system solutions for small and medium manufacturers (see TREKKER 325). Our client base includes both Agrifac and Amazone. Motrac have developed the hydraulics for their self-propelled spraying machines, including the hydrostatic drive. These two machines started out with an identical format, but both brands have been following their own individual development paths for some time now. And the same is true for the hydraulics, with different teams of engineers here at Motrac working independently on the two models. The Agrifac Condor features tank capacities from 3,400 to 8,000 litres and boom widths from 24 to 51 metres. The smaller engines deliver 205 or 282 horsepower, the larger models go as high as 320 hp. The spray pump options include a centrifugal pump with a capacity of 700 l/min or a twin piston membrane pump of 560 l/min. The Amazone Pantera has a tank capacity of 4,500 litres and boom widths from 21 to 40 metres. The Pantera has a 218 hp engine and a twin piston membrane pump delivering 530 l/min. Both machines have a pendulum tandem chassis with individually sprung wheels. 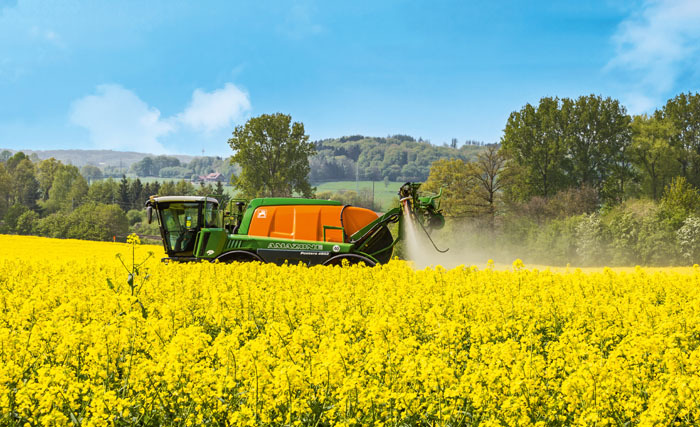 The chassis, specially developed for spraying machines, ensures that the motion of the vehicle is not transferred to the spray boom. Four-wheel drive, adjustable track width and height all add to the impressive versatility of this chassis. 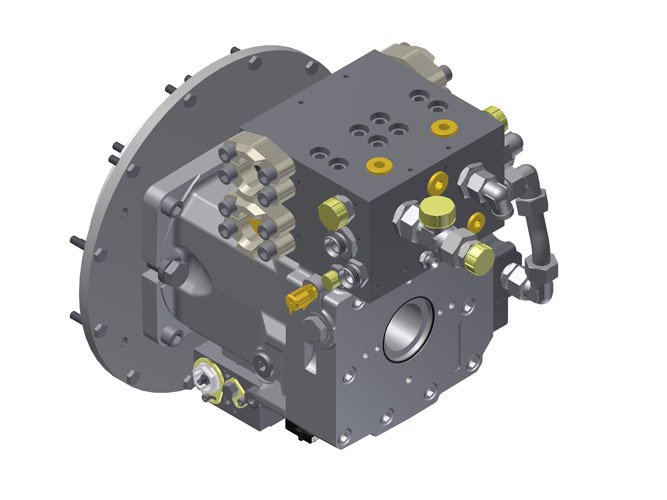 There are no mechanically driven parts on the spray machines, while the hydraulic pumps are driven by the diesel engine, including both adjustable pumps and gear-driven pumps with a fixed delivery per revolution. Which pump does what differs between the two brands. The pumps can operate on either open or closed circuits. 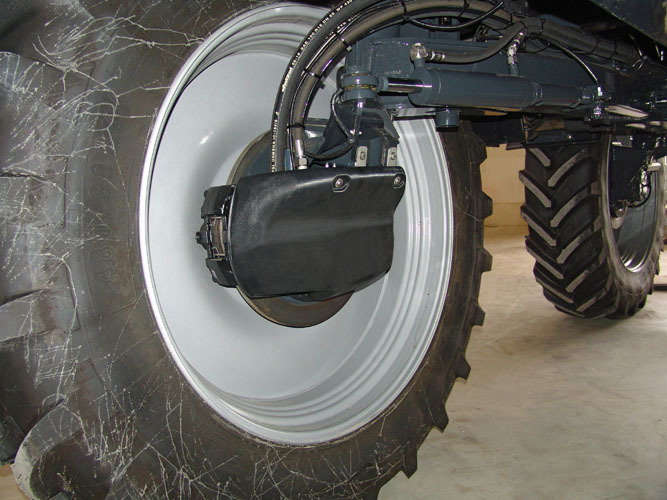 Drive to the ground wheels for example uses a closed circuit. This delivers higher efficiency than an open circuit, as fewer valves and restrictions are required. The kinetic energy from braking can also be fed back to the engine via a one-to-one linkage, something which is impossible with an open system, where the braking energy is converted to heat, requiring a larger quantity of oil. A closed circuit therefore allows a far more compact construction. 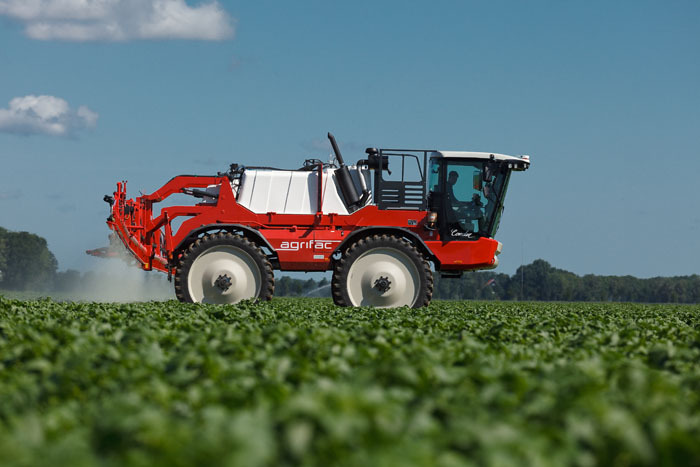 Agrifac spraying machines are available with AirFlowPlus air support, using hydraulically driven fans on the boom. Agrifac have built in a second closed system with an additional closed loop adjusting pump alongside the ground drive system. The other hydraulic circuits on this spraying machine are open. 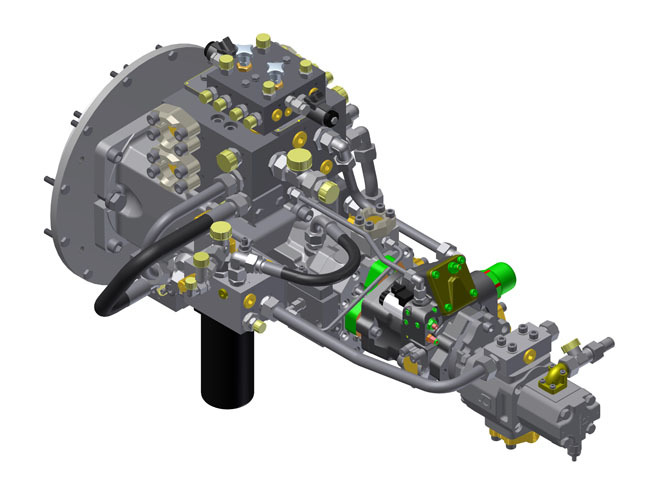 Motrac Hydraulics supply the entire pump line preinstalled with the necessary valve and manifold technology as developed in house and assembled by Motrac (formerly IMAV) at their factory in Baak, Gelderland. The pump line can be flanged directly to the engine. Motrac also do this work in-house for one of their clients, with the complete pump line and diesel engine assembly delivered as a unit to the production line. The customer is responsible for the mounting of the electronic drive to the pumps. 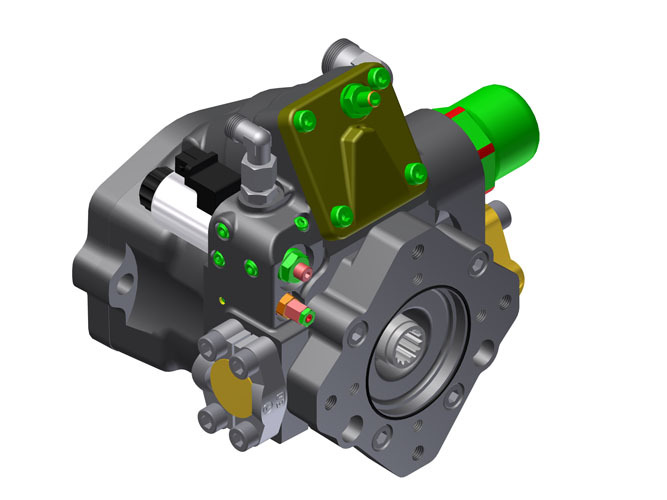 The first pump downstream of the motor is the drive pump, a Linde HPV model. The stroke volume is adjustable depending on the size of the machine, with maximum volumes of 165 or 210 cc available as options. Oil is sent out to the cooler from the low pressure (return) side. A manifold mounted on the pump splits the oil flow and sends it to the four wheel drives. The maximum operating pressure is 420 bar. The second pump runs at a constant pressure and provides oil for all consumers including the steering, the track width adjustment, the folding out of the boom and so on. 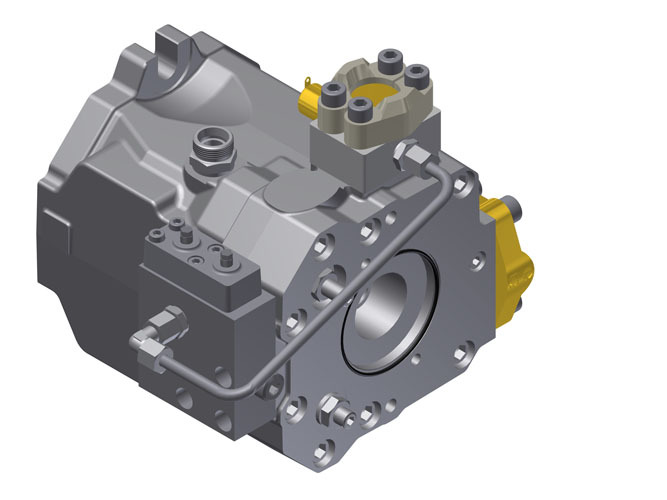 Using a constant pressure pump for the steering (which requires pressure at all times) avoids the need to set up a priority switching system and allows the use of standard Cetop valves. This is also a Linde pump, either an HPR 55 or a 75, with maximal delivery of 55 or 75cc. The third pump is a Linde MPR50. The "M" here stands for medium pressure, and the 50 refers to the adjustable stroke volume. This pump delivers the drive to the spray pump. The special feature of this pump is that it can be adjusted right down to 0 cc at 0 bar, something which is far from common with adjustable pumps in open circuits. This results in zero energy loss when the pump is not running. There is also no pressure difference between pump pressure and load pressure (LS pressure difference is around 25 bar). This delivers a further energy saving. At the end of the pump line are two fixed stroke volume gear pumps. The first of these provides the feed pressure. 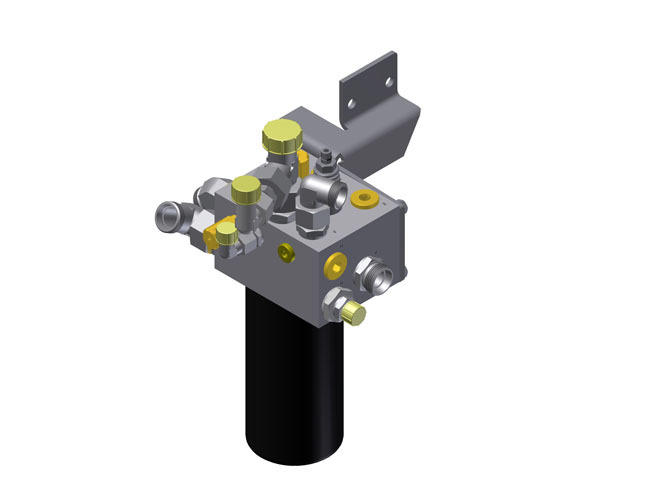 The feed pressure serves to fill and replenish the closed system for the ground drive, for distribution to the cooler and for the control of the MPR 50 for the spray pump. The rearmost pump is also the fixed stroke volume type and drives the cooler fan. All return oil streams from the open and closed systems are brought together, filtered, cooled and sent to the oil tank. This flow passes through a small separate manifold. This can be mounted in an easily accessible location so that it is easy to connect all the consumers. The effective oil volume of the system is around 120 litres. 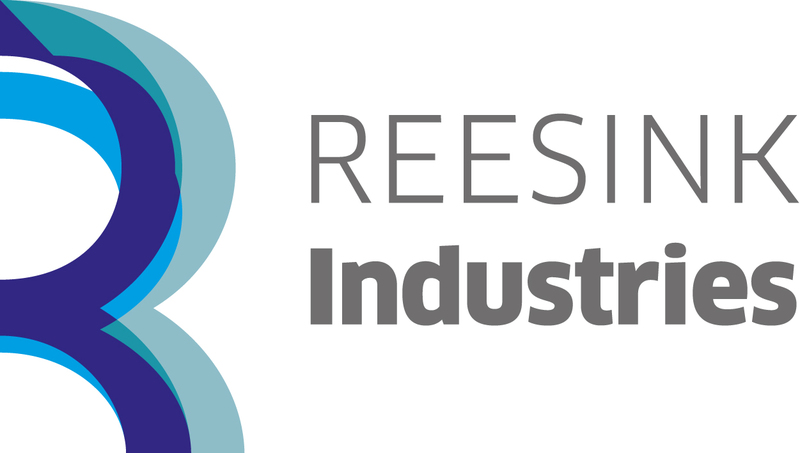 There is a trend for these quantities to be steadily reduced, but this has certain negative effects, for instance in relation to the replenishment interval. The wheel motors are also by Linde. The simultaneous swivelling of the pump and the drive motor provides plenty of traction when pulling away and the system can always be operated at maximum efficiency. The system includes an anti-slip system, which makes it unnecessary to fit a differential. A rev sensor is fitted to each wheel motor. The sensor detects when one wheel loses traction and the electronics will then cut power to that wheel, back to zero if necessary. This allows the other motors to develop more traction. The electronics also ensures that the speed doesn't increase, by turning the pump down as necessary.